Are you looking for the best home made chili recipe ever?! Well, you’ve just discovered the treasure you’re looking for. This recipe is simple, healthy, and tastes great. Perfect for the gluten sensitive members in your family. It’s a dream for your hunter’s belly on a cold night out in the woods, or a perfect meal to come home to, while blanketed next to the fireplace. And most importantly, this will be your kids favorite chili recipe for generations; one I received from Grandma Sue, and am passing on to you. Thanks Grandma! Brown meat in an extra large saucepan. Boil your water, cook, and drain your pasta while your meat is cooking. If using Gluten Free pasta, store it in a separate container. If you add it to the crockpot later, the pasta will disintegrate due to the absence of gluten. Cut the vegetables while the meat is browning. Add the spices to the meat starting with the chili powder. Mix well and saute for a short time. Add the onion, celery, and peppers to the meat/spice mixture and saute until the onion starts to get translucent. Add the stewed and raw tomotoes, kidney beans and V-8. Cook on stove until all ingredients are well blended and warm. If your pan doesn’t fit all the ingredients, you can add the V-8 juice to the crockpot later. Transfer all ingredients to crock pot. 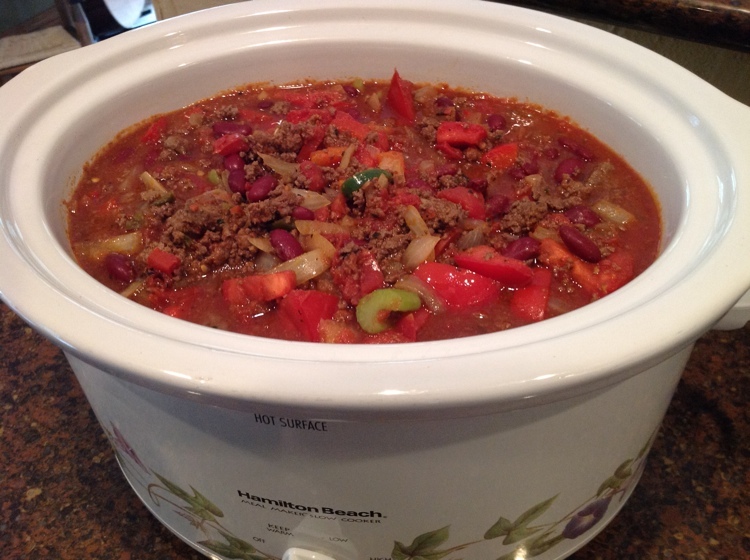 Set your crock pot to Keep Warm. Taste test your creation. If you like it more spicy, add cut jalepeno peppers and/or Chalula sauce. Immediately serve, or let simmer for 3 hours if you like your veggies softer. Don’t forget to serve your pasta with your chili!. Lastly, enjoy your meal with your family and friends! Let us know how it tastes.